You probably know by tasting the chocolate if it is good or not, but pinpointing the exact reasons behind the quality can be a little more difficult. Taking that to the next level and actually producing high-quality chocolate for your candy products is even more of a challenge. You know you want to use the best chocolate in your products, but you may not know what actually goes into making good chocolate. The best chocolate for candy making is high quality on its own. You can’t hide bad chocolate with caramel, nuts or other ingredients. If the chocolate is low quality, the quality of the finished product suffers. The taste, texture, cocoa content and even the aroma make the difference between good chocolate and bad chocolate. 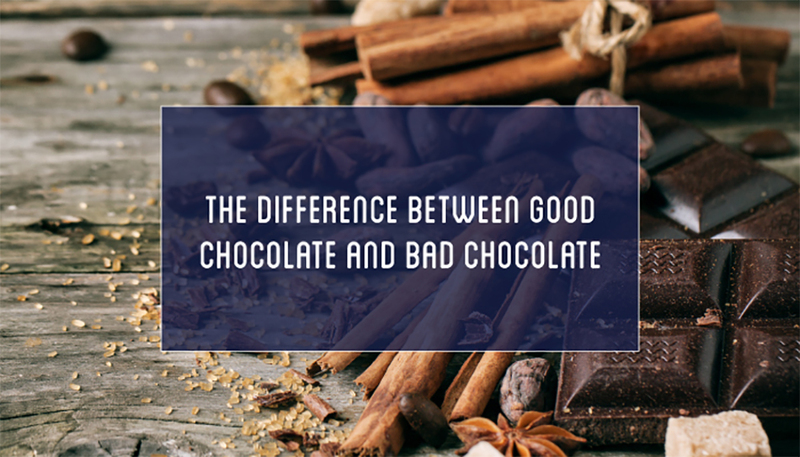 We know a good chocolate when we see and taste it, so let’s delve deeper into good chocolate versus bad chocolate. By the time you’re done, you just may feel like a chocolate expert yourself. Before we define what makes good chocolate, it’s important to understand how it is made. Eating chocolate is the easy part, but many people don’t know how to make chocolate. Each step of the chocolate manufacturing process has a major impact on the end flavor and overall quality of the chocolate product. Ignoring quality standards at any step in the chocolate manufacturing process negatively impacts the quality and depth of flavor when your chocolate candy hits the store shelves. It all starts with the tropical cacao tree commonly found in western Africa, Columbia, Mexico, Costa Rica and countries with similar climates. 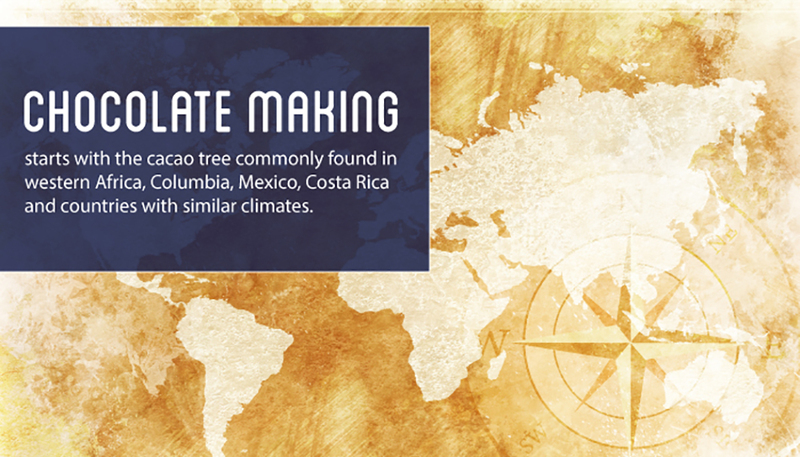 It takes just the right amount of rainfall, along with high temperatures, for the cacao tree to thrive. The cocoa beans grow inside the fruit on cacao trees, which are often grown on large plantations in these ideal locations. Once removed from the fruit, the beans are fermented and dried in the same location where they are grown. The specific variety of cocoa bean determines the proper fermentation process, which causes the chemical changes that help the chocolate flavor develop. A cocoa grower who understands the impact of the fermentation process on the flavor of the chocolate provides better-quality cocoa beans. The drying process locks in the effects of the fermentation, so the cocoa beans retain the perfect flavor during transport from the plantation to the manufacturer. When cocoa beans arrive at the chocolate manufacturer, they are cleaned. In some cases, cocoa beans of different varieties are mixed together to create a more complex combination that dictates the flavor of the finished product. From there, the cocoa beans are roasted to get rid of moisture and add even more complexity to the flavor. The roasting process is what brings out the rich chocolate flavor. The length and temperature of roasting varies and affects the final flavor of the chocolate. The same chocolate manufacturer might roast cocoa beans from different origins for different lengths of time to bring out the best taste. Once roasted, the outer shell comes off the beans to reveal the inside, called the nibs. Cocoa nibs consist of about 50 percent cocoa butter. The nibs get ground into cocoa liquor, also known as cocoa mass. The cocoa liquor is further processed through pressing, which separates out the cocoa butter and leaves behind the cocoa cake. Cocoa cake becomes cocoa powder when it is ground. 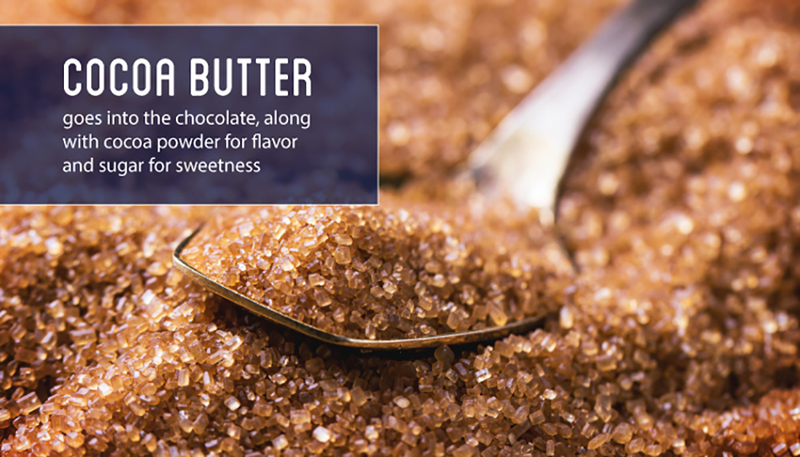 Cocoa butter goes into the chocolate, along with cocoa powder for flavor and sugar for sweetness. The cocoa butter creates the melting quality of chocolate. Milk goes into the mix to make milk chocolate. White chocolate uses only cocoa butter without any cocoa powder. Some chocolate also contains an emulsifier, such as lecithin. Emulsifiers decrease the chocolate’s viscosity. When used, not as much cocoa butter is needed to produce the chocolate. Whether or not lecithin or another stabilizer is used depends on the preference and production processes of a particular chocolate manufacturer. All of the ingredients that go into a particular batch of chocolate get mixed together through a process called conching. Special machines mix and knead the ingredients in a process that lasts anywhere from hours to days. Conching affects how the chocolate tastes when it is finished. The tempering process comes after conching. This process applies heat to the chocolate mixture to crystallize the cocoa butter. Once tempered, the chocolate gets poured into molds and hardens into large blocks of chocolate. Cocoa Nibs, Cocoa Liquor, Cocoa Butter or Cocoa Powder? Let’s take a closer look at the differences between cocoa nibs, chocolate liquor, cocoa butter and cocoa powder. Each component of the cocoa bean plays a role in the quality and flavor of the chocolate. Cocoa nibs are the inside pieces of the cocoa bean. They are small, broken pieces of the bean after it has been fermented, dried and roasted. Edible as is, cocoa nibs are typically made into chocolate liquor. Cocoa liquor can come in either a solid block or a molten liquid consistency. It is the first product that comes out of the roasted and shelled cocoa beans or cocoa nibs. 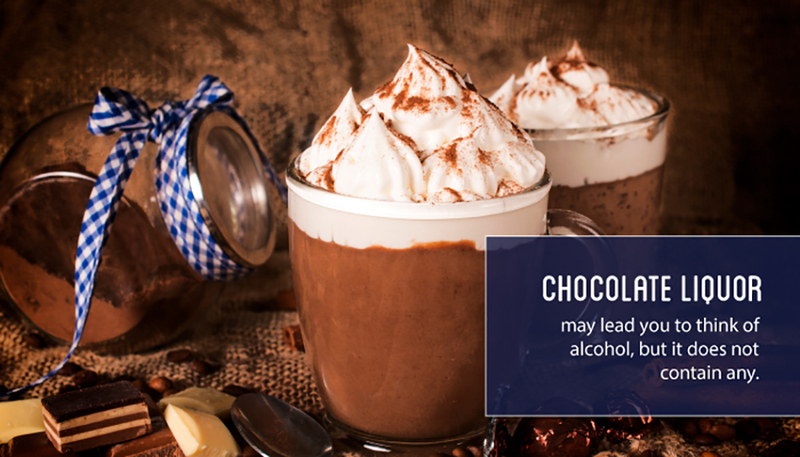 Chocolate liquor may lead you to think of alcohol, but it does not contain any. Names for this chocolate component that appear on ingredient labels may include cocoa liquor, chocolate liquor, cocoa mass, cocoa beans, chocolate beans, cocoa seeds and chocolate seeds. Chocolate liquor sometimes goes directly into chocolate, but often it is separated into the cocoa butter and cocoa powder before being combined again when the chocolate is made. Cocoa butter remains solid at room temperature, unlike many vegetable oils that take a liquid form at most any temperature. As cocoa butter nears body temperature, it become soft and starts to melt into a liquid state. It has several crystallization and melting ranges – about six stages total – that slightly overlap, which helps create that one-of-a-kind feeling when it melts in the mouth in the form of real, high-quality chocolate. Cocoa butter doesn’t go rancid as quickly as some vegetable oils, leading to a longer shelf life. You’ve probably seen cocoa butter listed on some cosmetics or pharmaceutical products. That’s because cocoa butter also has moisturizing effects that work well in care products. We’ve established that the cocoa bean growth and processing affects the flavor and quality of chocolate, but what about the other ingredients? The chocolate you consume is more than cocoa liquor, cocoa butter and cocoa powder. The quality of the nonchocolate ingredients, including milk, sugar, vanilla and stabilizers, also affects the quality of the finished chocolate product. Pure flavorings and natural ingredients, rather than artificial flavoring, produce the best-quality chocolate candy. Chemical preservatives also affect the flavor and quality of the finished product. Top-notch chocolate products use the simplest, purest ingredients so the true flavor shines through. Not all candies and products with a chocolate flavor are considered real chocolate based on complex FDA guidelines and regulations. Some products use ingredients other than parts of the cocoa bean to save money or have more control over the manufacturing process. Chocolatelike products almost always have an inferior taste and quality when compared to real chocolate. The label of chocolate candy provides several clues to help you determine if the product is real chocolate or a chocolatelike product. When assessing the chocolate, take a look at the ingredients list. High-quality chocolate uses some form of cocoa as the main ingredient. 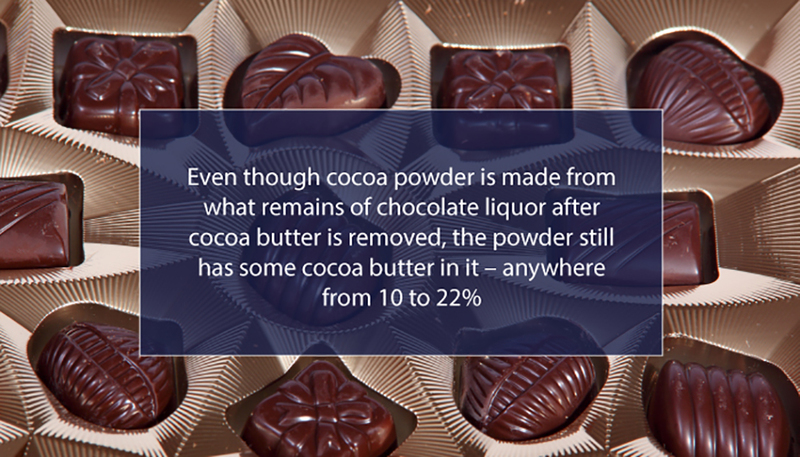 Some products list chocolate liquor on the label, while others list the two components – cocoa butter and cocoa powder – separately. To qualify as chocolate under FDA standards, the product has to contain a minimum amount of chocolate liquor. Products not meeting those minimum requirements must be labeled as chocolaty or chocolate-flavored. They are sometimes called compound chocolate. Compound chocolate still uses cocoa powder as the chocolate flavoring, but the fat comes from a source other than cocoa butter – typically vegetable oil. You might see hydrogenated or partially hydrogenated vegetable oils such as palm, soybean or cottonseed oil listed on the packaging. These ingredients should send up red flags about the quality of the chocolate-flavored product. Quality chocolate needs rich cocoa butter on its ingredients list to produce that melt-in-your mouth texture chocolate lovers crave. So why do chocolate makers use vegetable oil instead of cocoa butter? It usually comes down to price and how easy it is to work with. Vegetable oil is more cost-effective than cocoa butter and is much less temperamental during the manufacturing process. Cocoa butter must be tempered to avoid crystallization and clumping. Tempering refers to manipulating the temperature of the chocolate during the cooking process to control the crystallization of the cocoa butter. Without tempering, chocolate made with cocoa butter won’t come out to the desired smooth, creamy texture and will lack the glossy appearance and crisp snap when broken that indicates a quality chocolate. As a general rule, compound chocolate is inferior to true chocolate that is made with cocoa butter. It lacks the depth of flavor you get with real chocolate, and the texture doesn’t come close to the silky chocolate texture that melts as soon as it hits your tongue. Cocoa Percentages – What’s in a Number? As if the type and quality of ingredients that go into the chocolate aren’t enough to digest, cocoa percentages also come into the mix to affect the flavor of chocolate. This is especially true for dark chocolate. The cocoa percentage in chocolate measures the total amount of cocoa between the chocolate liquor, cocoa butter and cocoa powder. Don’t let the cocoa percentage fool you. A high number in the cocoa percentage column doesn’t automatically earn the chocolate a gold star for quality. That’s because cocoa percentage itself doesn’t dictate quality. Two chocolate bars that are both 60 percent cocoa may have completely different quality levels. Likewise, you may have a 70 percent cocoa bar that is lower quality than a 50 percent cocoa bar based on the ingredients used and the production process. The cocoa percentage of a particular chocolate does affect the taste, though. 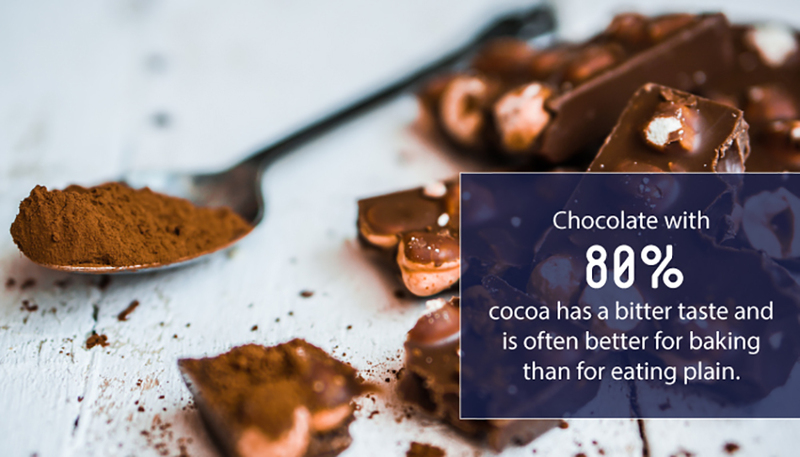 As the cocoa percentage increases, the chocolate flavor intensity and darkness also increase, while the sweetness decreases due to lower amounts of sugar added to the chocolate. Quality dark chocolate generally has a minimum of 60 percent cocoa. Chocolate with 80 percent cocoa has a bitter taste and is often better for baking than for eating plain. You may not know all the details of the chocolate manufacturing process, but you can assess its quality even after it’s already made. You don’t even have to touch or taste chocolate to do an initial assessment of its quality. The physical appearance can reveal some information about the chocolate candy. 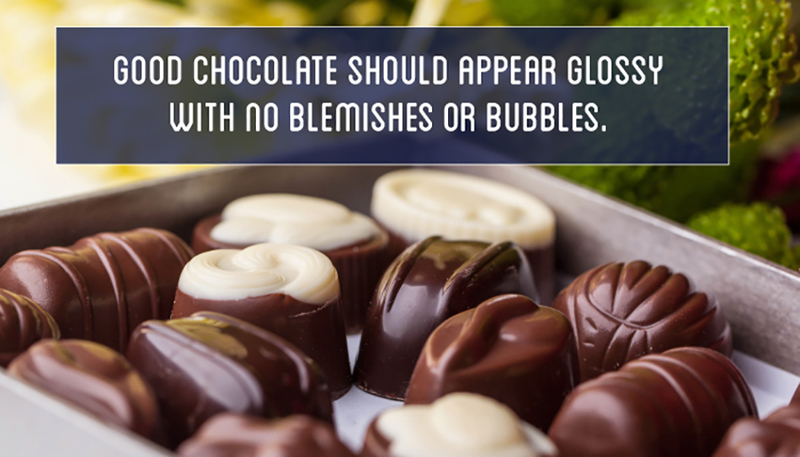 Good chocolate should appear glossy with no blemishes or bubbles. Gray areas, cloudy spots or swirls of discoloration tell a story of the chocolate’s past – and it could affect the consumer’s perspective of its quality. Chocolate bloom appears as white or gray spots on the chocolate’s surface. The fat – cocoa butter in real chocolate – makes its way to the surface of the chocolate and crystallizes there. This often happens if the chocolate melts after production and hardens again. Chocolate with liquid fillings, such as caramel, may be more susceptible to chocolate bloom. While not necessarily harmful to the chocolate’s quality, bloom can indicate improper handling or exposure to extreme temperatures. Even if the bloom doesn’t indicate spoilage, customer complaints often stem from the discoloration, so it pays to manage the chocolate manufacturing and storage process to reduce the potential for chocolate bloom. Your nose may not seem like a highly sophisticated analysis tool, but it can offer clues on the quality of chocolate. High-quality chocolate should smell strongly of chocolate. Other smells, such as a frozen or spicy scent, could indicate improper storage. The chocolate could have been frozen for an extended period of time or stored near other food items with a strong scent. Chocolate soaks up scents from other items, potentially lowering the quality. To test the scent, touch the chocolate gently to release the aroma. Check for a silky and not a sticky texture while you’re at it. A quality product smells of rich chocolate and not of spices, vanilla or other scents. The stronger the rich scent of chocolate, the greater the likelihood that you are about to enjoy a piece of high-quality chocolate. Your chocolate won’t talk to you, but it will make sounds that give you clues about its quality. In particular, the sound of chocolate as you break it is an indicator of quality. Good chocolate has a clean, crisp, sharp snap when broken. Milk and white chocolate both tend to bend because they have more sugar and milk than dark chocolate. Lower-quality dark chocolate also bends instead of snapping cleanly, has a dull sound when broken or simply crumbles when you try to break it. It’s finally time to engage your taste buds to evaluate the quality of the chocolate. Taste is one of the most obvious tests of quality and the one by which most people judge their chocolate candy. The flavor is determined by the quality of the cocoa beans and the manufacturing process. Even the skills of the chocolate manufacturer can affect the outcome in the flavor department, but taste is more than just the flavor of the candy. The texture and how quickly the chocolate melts also go into the quality factor of the chocolate. High-quality chocolate made with real cocoa butter feels smooth and velvety in your mouth. 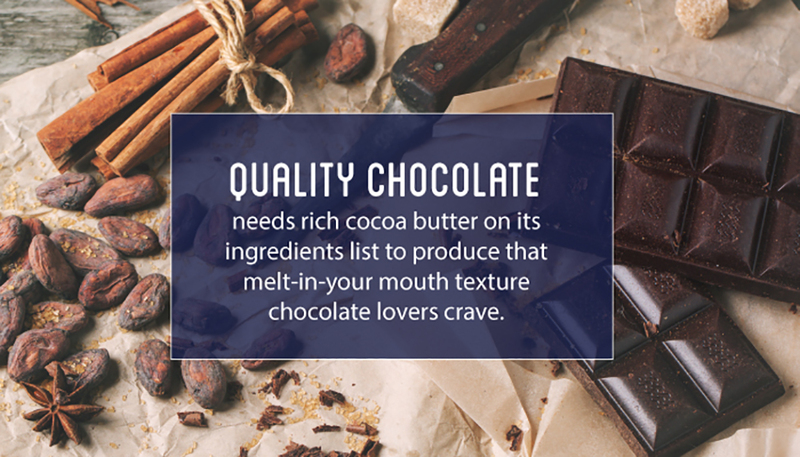 Also known as mouth-feel, high-quality chocolate has the distinct texture that is difficult to describe but easily recognizable when you feel it in your own mouth. A gritty or waxy texture often means the chocolate is of lower quality. Since cocoa butter melts at or just below body temperature, quality chocolate melts quickly in the mouth or in the palm of your hand. When tasting chocolate, let a small piece melt on your tongue to experience the full depth of the flavor. Note the texture and how the chocolate feels as it melts in your mouth. The taste of quality chocolate won’t leave your mouth quickly. Instead, the flavor should linger for several minutes after you finish the piece of chocolate. With the average American consuming 11 pounds of chocolate per year, chocolate manufacturing is big business. 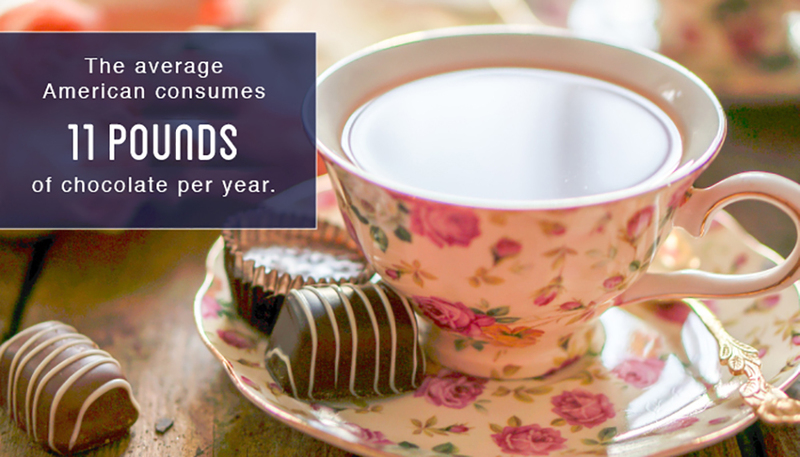 Your choice in contract chocolate manufacturers could affect how much of the annual chocolate consumption your company supplies to consumers. Quality of ingredients: Does the manufacturer use cocoa butter instead of vegetable oil? Are the extra ingredients used to make the chocolate high quality? Can the manufacturer use organic or specialty ingredients? Facilities: What type of equipment does the manufacturer use? Does the company offer state-of-the-art equipment and manufacturing facilities? Manufacturing experience: How long has the company been in the contract chocolate manufacturing business? What is the company’s track record? How much contract manufacturing does the company do? Innovative ideas: Does the manufacturer stay on the cutting edge of chocolate production? Is the manufacturer willing to work with your company to customize the products and meet your exacting standards in order to create the highest quality chocolate candies? Will the company help you come up with innovative new products for your line? Total package: Can the manufacturer also provide you with custom packaging that makes your chocolate candy products jump off the shelves? Does the packaging take into consideration both preserving the quality of the chocolate and creating an attractive presentation that appeals to customers? Understanding what makes good chocolate and how to spot bad chocolate gives you a leg up when choosing a manufacturer to produce your chocolate candy products. Warrell Corp. knows good chocolate. We’ve spent 50 years perfecting our candy manufacturing expertise. With state-of-the-art facilities and high-quality ingredients, we are ready to serve your candy manufacturing needs. Very good post this has given me a lot of insight on the manufacturing of quality chocolates. Thanks. Very interesting article. I finally understand the differences between coco mass and coco butter. Reaffirmed my reasons never to buy compound chocolate again and just because some chocolate comes with fancy packaging, doesn’t mean it’s quality. Untempered chocolate does not have the sheen or snap. It does however win hands over heel when it comes to texture and taste. Tempered chocolate no matter who, were or how it is done cannot compare to the beauty of eating untempered chocolate. The trick with this is the immense care required in its storage. Very goodly written article. I learn a lot abut chocolate. It is of the most unfortunateness that chocolate is very expensive. Chocolate is so very much testy. OawUBe Im thankful for the blog article.Really thank you! Keep writing.